Talk: Effective Projects, how to formulate them? You must be a member of the Santiago de Chile Global Incubator Group to attend this activity. Would you like to join this group? Nobody said that it is easy to formulate a project, and much less when there are a lot of important things unknown to get it going. If you are thinking of creating your own venture and do not know how to start or have already created it and do not know how to continue, we invite you to participate in the free talk, where attendees can develop tools related to the formulation and design of a project to improve their idea of business, planning and organizational structure. Train in the formulation and development of high efficiency projects, together with reporting the tax obligations and duties that all Entrepreneurship and SMEs have at the time of implementing their business. 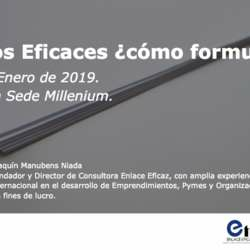 Joaquín Manubens Niada: Founder and Director of Enlace Eficaz Consultancy, with wide national and international experience in the development of Entrepreneurship, SMEs and Organizations with or without profit. In addition, he serves as an advisor and mentor to leaders and high-performance teams in companies, in order to improve the quality of life of people in their work context. To whom is the activity directed? What should the assistants bring? We wait for you 🚀!